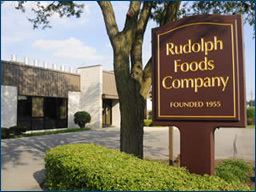 Manufacturing jobs for Rudolph Foods, apply online now! "Nobody Makes Better Tasting Pork Rinds." Since 1955, the state-of-the-art facilities; but there are a few items that are even more important to us. All those years ago, John and Mary Rudolph instilled in us a strong sense of the basics: integrity, respect and family values. Rudolph’s idea of family has happily stretched to include more than 400 employees around the world. Rudolph employees are our neighbors and friends–because no matter the zip code, we’re one community working together to create the tastiest and highest quality snacks on the shelf today. And we're innovating the snack food aisle, too! "The two most important things about working at Rudolph Foods: Pride – I take pride in making the best tasting pork rinds for our customers. Stability – I have been here 30 years and have never been laid off or had a lot of absences. Rudolph’s is a family orientated business and I feel like the employees here are a part of my family." When you join the Rudolph Foods family, you will find an opportunity to learn from and grow with good, honest folks. Now you know a little bit about us, see our career opportunities to the right and let us hear about you! Ask about our Safety Jackpot Employee Incentive Program. Rudolph Foods is one of the national organizations who rewards employees excellent safety-focused activities through Safety Jackpot. Safety Jackpot creates an exciting environment of safety awareness by getting players involved, generating "talk" and rewarding everyone who is safety conscious. Check out Rudolph Foods employee, Tim Sorey's recent $10,000 Safety Jackpot win! Loved throughout the world, Rudolph Foods pork rinds and snacks are produced and distributed around the world from three continents.